The following is a personal response and some thoughts from Dr. Dale regarding the recent article posted by The Washington Times. 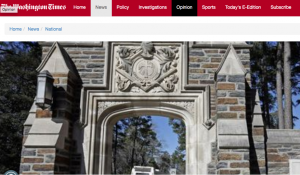 The prestigious private school in Durham, North Carolina, said it will take additional steps on “research integrity” and says it already has implemented more monitoring of research in the wake of the scandal, which involved a health researcher and her supervisors. Dr. Dale: When will our government decide to actually punish researchers/companies that commit research and scientific fraud like this? Drug companies, the medical community, and even the CDC commit fraud at the expense of both taxpayer dollars and human life! Consequences of such crimes should be that the organization and researchers should NEVER receive funding from taxpayers’ money ever again! The punishment should be one strike and you are OUT. Instead, these researchers pay a fine, which what you will see next in this instance is only a portion of the funding they received, so basically they are still getting paid to commit these crimes. These criminals will continue to be able to receive even more money in the future so long as these criminal organizations “promise” to monitor better. Think about it— they are going to pay us back with our tax dollars if allowed to acquire more funding through the government. …A whistleblower said Duke falsified research on nearly $200 million worth of grants, and he will collect nearly $34 million for his role in uncovering the fraud, which prosecutors said spanned from 2006 to 2018 and involved money from the National Institutes of Health and the Environmental Protection Agency. The chief researcher at the center of the scandal, Erin Potts-Kant, had more than a dozen papers stemming from her work on mice retracted. Prosecutors said the school’s higher-ups knew about her fraudulent research but allowed it to continue. 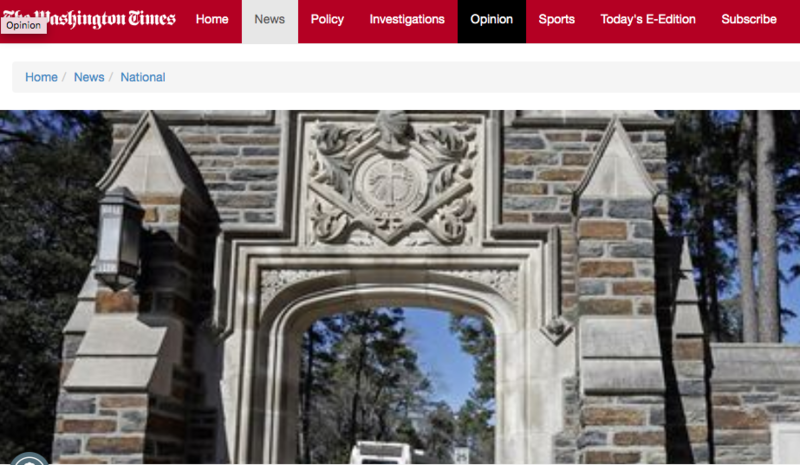 …Duke is dealing with a different research scandal dating back more than a decade, The Associated Press reported. Dr. Dale: This is not the first instance where Duke has committed such crimes. The bible is correct, “When the sentence for a crime is not speedily executed, the hearts of men become fully set on doing evil”, Ecclesiastes 8:11. The justice system seems to be too slow and Duke seems to believe that they can continue with their crimes. …Duke medical professor Anil Potti engaged in misconduct while researching treatments in human cancer patients. Mr. Potti’s studies were published in top medical journals, including the New England Journal of Medicine and Lancet Oncology between 2006 and 2009. In a settlement reached with the federal health agency, Mr. Potti did not acknowledge liability but agreed to have all his research supervised until 2020. Mr. Potti left Duke in 2010. Duke settled lawsuits brought by patients and estates of patients who participated in those medical trials. Dr. Dale: Shouldn’t the Department of Justice actually be serving justice instead of handing out deals to criminals? If this guy is guilty he doesn’t deserve, or rather cancer patients don’t deserve to be placed at risk by a researcher who is committing crimes. Because justice was not served, more lives will likely will be placed at risk! …As a result of both cases, the National Institutes of Health last year required Duke University researchers to increase their reporting of how federal grant money was being spent. Dr. Dale: I think we can all agree that most liars don’t show their hands, and it is likely that there are far more counts of fraud still hidden in Duke’s past. Let’s get this straight… after committing multiple counts of fraud over many years and having multiple levels of the school’s staff involved or with knowledge of the fraud, no person who committed the crimes has went to jail. Furthermore, the school will pay back just over half of the money they stole and those researchers and the school will only simply have to “increase their reporting.” How many store owners would let a clerk who stole from them multiple times keep their job and simply require that employee to “keep better records” of the money… They are literally asking criminals to report on their own actions as if that fixes the issue. It’s ridiculous! Also, remember that when one lies about the effectiveness or the safety of a medical/drug treatment people ultimately are harmed and/or die. This means the actions of this school and their employees has killed and harmed people. If someone did the same with a baseball bat or gun, that criminal would pay a higher penalty than this and and serve jail time, if not be put to death. Our justice system MUST change or these “white collar” crimes in the pharma and medical industry will continue.